Skywatchers, take note: This week is your best opportunity of the year to see the planet Mercury as a "morning star." Of the five planets known since antiquity, Mercury is by far the most rarely seen by the average person. In fact many serious astronomers have never seen planet Mercury, including the famous German astronomer, Johannes Kepler. Our best chances of seeing Mercury are during the periods when it is farthest from the sun, called greatest elongations. Because of the inclination of the ecliptic, the path the sun and planets take through the sky, not all elongations are equal. Only twice a year is Mercury's elongation favorable, once in the evening and once in the morning. This week is the best morning elongation of 2011 for observers in the Northern Hemisphere. The best evening elongation this year was in late March. Good elongations in one hemisphere are usually bad ones for the other hemisphere, so the best elongations in the south this year are May 7 (morning) and November 14 (evening). 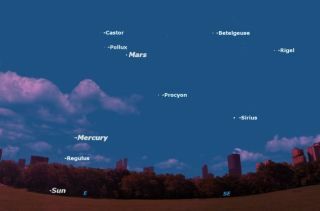 The best way to spot Mercury this week is to find an observing location with a low eastern horizon. Start looking at least half an hour before sunrise; it may help to sweep the horizon with binoculars. The sky map of Mercury here gives you some guideposts to finding the hard-to-spot planet. The predawn sky is ablaze with bright, first magnitude stars: Sirius, Procyon, Betelgeuse and Rigel in Orion, Castor and Pollux in Gemini, and Regulus in Leo. Mars is now shining brightly right alongside Castor and Pollux, forming a distinctive triangle which can guide you straight to Mercury below them. If you point a telescope at Mercury, you won't see very much, because Mercury is very small and close to the horizon, where the air is most turbulent, causing light to blur. Follow Mercury with your telescope as it gets higher in the sky, and the image will gradually improve, as Mercury rises above the turbulence. This is the secret for getting the best telescopic views of Mercury: find it in twilight, then follow it as it rises. Over the next week, the relationship of these bright objects will change. Because of the Earth's movement around the sun, the stars will all shift upward and to the right, while the two planets will move downward and to the left. Notice that this puts Mercury and Regulus on a "collision course." Next Friday morning, Sept. 9, there will be a conjunction between Mercury and Regulus. These two objects will then fit together comfortably in the eyepiece of most small telescopes.